I was lucky enough to go on three Easter Egg hunts this weekend and my brother, sister and I have done very well with our chocolate stash over the last few days. I always feel a bit bad that Mum and Dad don’t get Easter chocolates too and we like to share our treats with them but we really like it best of all when we can surprise them with a treat of their own. I was very happy when Elizabeth Shaw offered me the chance to treat my Mum with a box of their chocolates- I know she has had some from their range before and liked them so this sounded great. They then made it really difficult by giving me a list of different flavours to choose from- they all sounded delicious! There was Orange, Mint, Lemon, Cappucino and Salted Caramel which all made my mouth water! In the end I went with orange because I love chocolate orange flavour and although I planned to treat my Mum I was hoping she would share with me too! The box of Milk Orange Crisp Chocolates arrived today with perfect timing as my Mum was worn out from listening to three hours screaming at a soft play centre and chasing my brother round so he didn’t keep trying to climb up the slides. I was able to give them to her when we arrived back home and she was thrilled with her treat. We all tried them this afternoon and they were lovely- really good orange flavour and very tasty. I liked the crispy honeycomb bits and Lottie liked the fact they were all wrapped up in shiny parcels like huge coins! We made sure we saved some for Dad when he got home from work and he really liked them too. It was really nice to be able to give my Mum a treat especially after being spoilt myself with chocolate this past weekend but I think the Elizabeth Shaw range would make a great present for most grown ups for any special occasion or just as a special treat or thank you. I think I might keep an eye out for the salted caramel ones next! Ssshh…. Don’t tell my Mum! Mother’s Day is coming up soon and I am putting my mind to something nice to make for her, I have to be a bit careful so I don’t show her all my ideas but I thought I would share with some of them here as they are all things children can make with little or no help and whilst spending very little money. 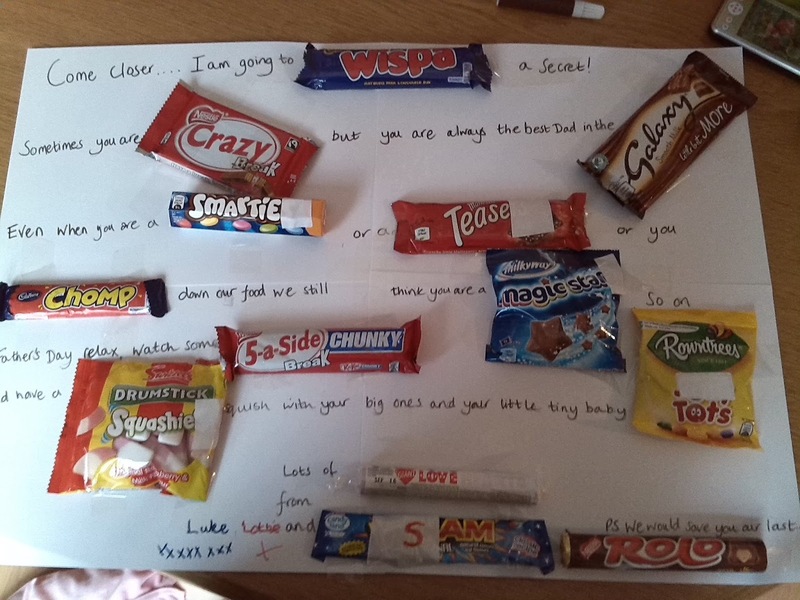 You might have seen that last year we made my Dad a special message with chocolate and I plan to do something similar for my chocolate loving Mum – obviously I can’t show you the secret message here as she will know what she is getting but below is the version we made for Father’s Day last year- which went down a treat! Whenever she gets the chance my Mum enjoys reading a good book and always has at least two on the go so Lottie has been making her a bookmark- this is really simple and she is really enjoying making it. She is only 4 so I have just taught her how to do a normal straight stitch but I think she is doing a fab job! I have seen an idea I really like of painting a piece of wood in a nice colour and once it is dry writing the word ‘LOVE’ in nice swirly writing but using a hand print for the ‘O’ and a pair of footprints for the ‘V’ – I thought I could do this using Sam’s hand and footprints as this would be a really nice way to keep them… I might need Dad’s help though as he is tricky to pin down! We are also going to be making up a batch of gift vouchers for my Mum to use with us- some will be especially related to us and others will be thing like a weekend breakfast in bed or ten mins of absolute silence! I think it will be quite fun thinking up ideas- although I am sure that some of the ideas won’t be as fun to actually do!